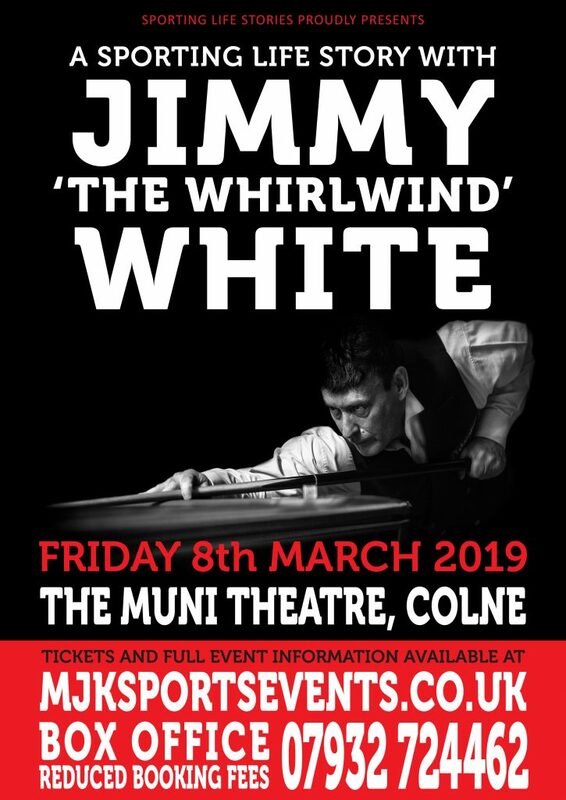 On March the 9th2019, Sporting Life Stories and MJK Sports Events are proud to host A SPORTING LIFE STORY with the ONE and only Jimmy White. The WHIRLWIND’ is one of the sport’s true characters in an age criticised for its lack of sporting personalities and at this event we hear about it ALL. From the early days of century breaks, through the ecstacy of major wins and 147s and the agony of missing out on the holy grail of snooker the World Championship. We will also see footage of some of the most magical moments ever witnessed on the green baize on our giant viewing screens. We could not pass up this unique opportunity to stage an exclusive night with the man himself, after hosting countless nights of snooker with Jimmy and also Ronnie O’Sullivans sporting life story this is an event not to be missed with one of the most colourful characters not just in snooker but also in the whole of sport. VIP ticket holders will receive a commemorative printed picture with Jimmy that will be taken before the show. In addition following the in depth interview of his life story, in his own words, an audience Q and A means YOU will have to chance to ask The WHIRLWIND a question too. This is Jimmy as relaxed and open as you will ever see him. This really is a story and an event not to be missed. We expect the night to finish at 22.30.